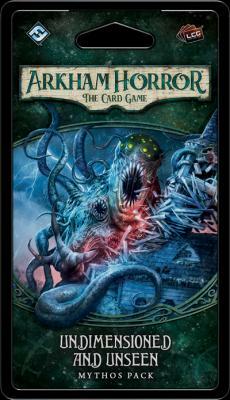 HomeCard GamesArkham Horror The Card GameUndimensioned and Unseen: Arkham Horror LCG Exp. Undimensioned and Unseen: Arkham Horror LCG Exp. Things are definitely getting weird. By the time your pursuit of two missing professors leads you through The Dunwich Legacy cycle to the scenario from Undimensioned and Unseen, you\'ll have traveled far from the familiar comforts of Arkham, and you\'ll have witnessed things you know no one would ever believe. You\'ll have encountered strange, extra-dimensional entities, and you\'ll find yourself neck-deep in furtive cultists and their sacrifices. A mystery within a mystery, the adventure you\'ll enjoy with Undimensioned and Unseen carries you ever closer to your ultimate goal, even as it challenges you to track down whatever Esoteric Formula (Undimensioned and Unseen, 254) may allow you to defeat a number of otherwise invulnerable Abominations. And it demands that you find this formula quickly… lest you should no longer be the hunter, but the hunted!